With the authority of a master, Boris Berman performs Debussy’s piano repertoire with nuanced interiority and a visionary outpouring of effusion. Since his immigration to Israel in 1973, Russian pianist Boris Berman has led an acclaimed career as a well-known pedagogue. This album of two CDs that reunites some of the major pages of Debussy serves as a reminder that he is also a tremendous artist. Captured in the excellent acoustics of the Domaine de La Romanée Conti, Berman’s interpretation permits us to taste the deep sonorities and the roundness of the timber of his refined and historic surroundings in a way that unites interiority and expressivity. Rather than drawing attention to the masterful haziness so dear to the Impressionists in the tradition of Gieseking, Berman privileges intensity, variations of stroke and richness of touch. In the two books of Preludes, one is struck by the art of his timing (Danseuses de Delphes, La terrasse des audiences du clair du lune), and by his way of imparting meaning to the contrasting dynamics (Ce qu’a vu le vent d’ouest), by increasing the richness of Debussy’s writing in the pieces that appear more rarified (Brouillards, Feuilles mortes, Les fées sont d’exquises danseuses) and by chiseling the rhythms (La Puerta del vino). At times, he produces a visionary reading, composed of strong sensations (La Cathédrale engloutie) or creating an image that, mutatis mutandis, resembles the magnificent effusion of Richter (Le Vent dans la plaine). The Estampes triptych reveals itself to be very convincing under the firm fingers that advance the discourse. There is some Matisse in this manner of presenting opposing sensations, as well as displaying the raw materiality beyond pure orientalism (Pagodes), with the art of suggestion (La Soirée dans Grenade), even a theatricality akin to speech (Jardins sous la pluie). The four pieces that complete this remarkable journey (D’un cahier d’esquisses, Hommage à Haydn, La plus que lente and the enigmatic Soirs illuminés par l’ardeur du charbon (1917), are rendered with a resurgence of suppleness and intensity. By its originality within a plentiful discography, this recording joins the essential interpretations of the Préludes alongside that of Michelangeli or of Zimerman (DG), of Paraskivesco (Calliope), of Rouvier (Denon), of Fergus-Thomson (Decca Evidence), of Planès (Harmonic de Records) and of Bavouzet (Chandos); in the Estampes, it takes its place by, and distinguishes itself in comparison to, François (EMI), Arrau, or Kocsis (Philips). Without a doubt, one of the most powerful events of this year of Debussy. 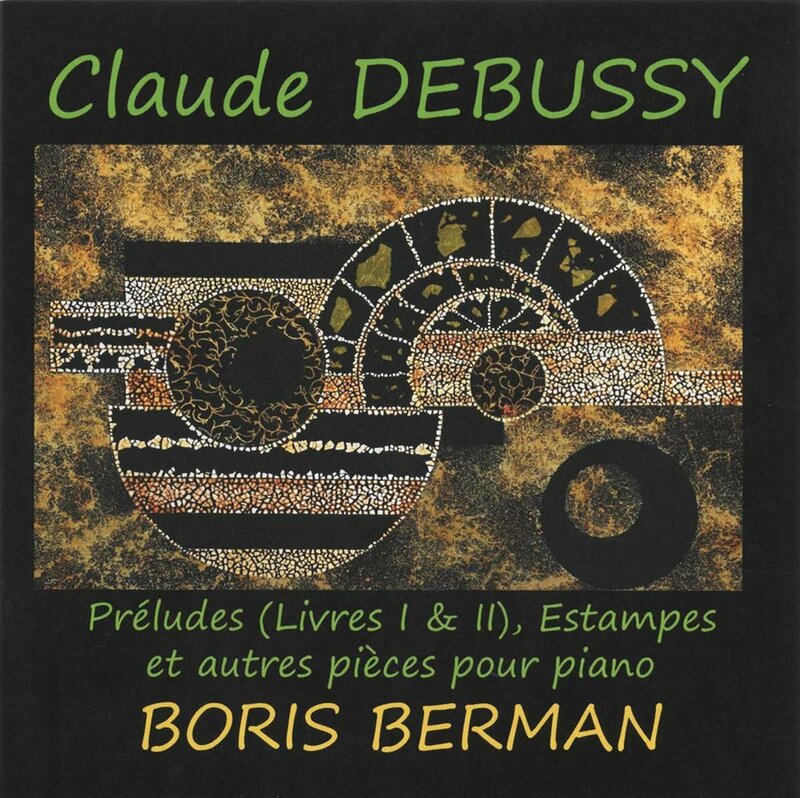 French label Le Palais des Degustateurs released Boris Berman's complete recording of Debussy Preludes, together with Estampes and other pieces. Concert with Yale Symphony Orchestra, Toshiyuki Shimada conducting, in the Great Hall of Moscow Tchaikovsky Conservatory during the tour in Russia in May 2017.